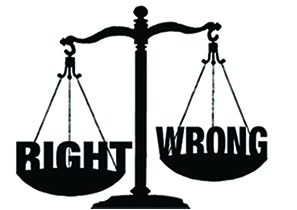 Ethics are the ancient rules of conduct which help create success in one's workplace and personal life. They make all good things possible, including civilization itself. Public schools stopped teaching ethics in the 1960s. The results are horrific. Ethics Solutions® is a fast and inexpensive way to teach employees, teens and others how to practice good ethical judgment. Explore what went wrong in our society ⬩ What educators recognized by the 1970s ⬩ Ethics in schools today ⬩ You are not alone if you think the situation is dire ⬩ The 3-step transformation ⬩ How our handbook teaches ethics ⬩ How to get your group Certified ⬩ And more!